Sailboat Nautitech 441 named Lady Beatrice II was produced in 2010. We propose her from port Martinique in area of Martinique. Lady Beatrice II is registered for 10 pax. Layout of the sailing boat is 10. Nautitech 441 Lady Beatrice II is equipped with 6 bedrooms. For guests disposal there are 4 heads. You can fill the tank for fuel with 400.00 l liters and in tank for water it goes even 800.00 l liters. With motor 2 x 28 kw Lady Beatrice II can sail really fast. Lady Beatrice II is 13.47 meters long and 6.81 m wide. Draft is 1.20 meters. Use the search engine for search for other vessels in this section: Catamarans Martinique. Yacht's equipment involves : Autopilot, Gps plotter, Mainsail with lazy jack, Dinghy, Inverter 12v-220v, Solar panels. . Caution has value 4570.00 EUR. Choose our offer and enjoy your holidays on the deck of Lady Beatrice II. 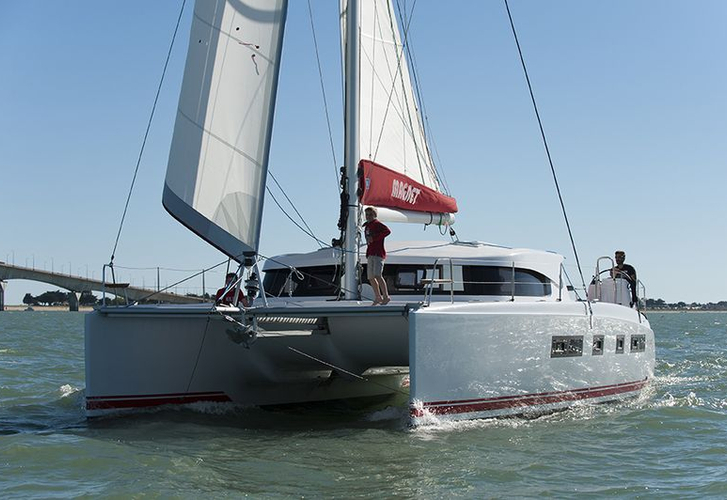 This Nautitech 441 from Martinique from Caribbean You can see by clicking on this link: Catamarans Caribbean.